Free stuff is pretty cool. Free internet is even cooler—and free internet that is actually free is the coolest. If you would rather avoid sitting in a Starbucks and having to listen to hipsters discuss the proper length of cropped jeans, then this should be of interest. FreedomPop made the news earlier this year when it introduced an iPhone 4, 4S, and iPod touch (4th gen) sleeve that allowed users to connect wirelessly to the internet. The sleeve gives up to 4G speeds by using cellular towers from ClearWire. The sleeve costs $99, but customers will then have access to 500 megabytes of data every month and the ability to earn up to 5 GB of free data by inviting friends and taking part in offers and promotions. Needless to say, a one time investment of $99 is going to be way cheaper then opting for a monthly data plan from your cell phone company or having to deal with data overages and fees. And since the sleeve practically turns an iPod into a iPhone, customers can opt to buy the cheaper iPod and skip the cost of the pricier iPhone and cellular plan. The company is accepting pre-orders now. 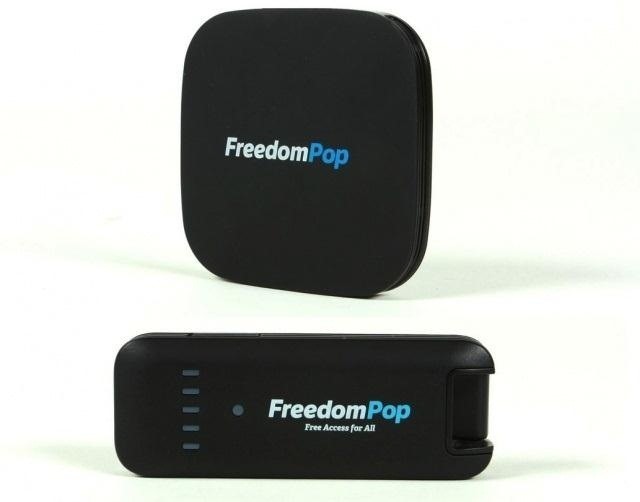 In addition, FreedomPop recently announced that it's now offering a beta service that gives users 500 megabytes a month of free 4G internet with a wireless hotspot and USB stick. This is great news for people looking to either supplement their current data plans or avoid having to buy a data plan at all. Identical to the sleeve breakdown, users will have access to 500 megabytes of free 4G service with the ability to snag up to 5 gigabytes by signing up for partner programs and promotions. 5 gigabytes of data would cost you $50 a month if you have AT&T and up to $70 with Verizon. There are no data caps, no speed downgrades, and no contracts. The wireless hotspot can connect up to 8 devices while the USB stick is great for your laptop or tablet. The company is accepting pre-orders on their website for those that are within the qualifying areas. Both devices are free, but the company does ask for a completely refundable security deposit—$49 for the USB stick and $89 for the modem. For those that want even more data the company offers super cheap data plans starting at $17.99 for 2GB and $28.99 for 4GB. All of the products are shipped on a first-come-first-serve basis, so if you are interested it's better to act sooner rather than later. why hasn't someone come up with a small device with preloaded tools and a super massive dictionary that would hook up your laptop, etc. and act as a wifi receiver with injection capabilities that automatically tries everything that is programed into it to crack the wifi password? it could even be weather-proof and solar powered so that one could drop it in a conveniently hidden location, gather tons of packet data, and cracks the password. that way, you could set it a close as possible to the victim AP. check back up on it in a few months or so, take it home, open the weatherproof casing up, remove the SD card, flash drive, etc. and grab the results. optimally, the results would be the entire password(s). if not, it would contain a hash or something as close to the revealed password as possible... anyways, just a suggestion to any Arduino people out there that knows about hacking. Hey Alex. I mentioned this on your forum post on the same subject, but you should check out the Transparency Grenade.